I am so souped not to be doing a mani in red white blue or any iteration therein. I OD'ed on 4th of July themed manis. I am therefore very happy to present something bright cheerful and utterly utterly me - a yellow and purple glittering gradient manicure. Yay! 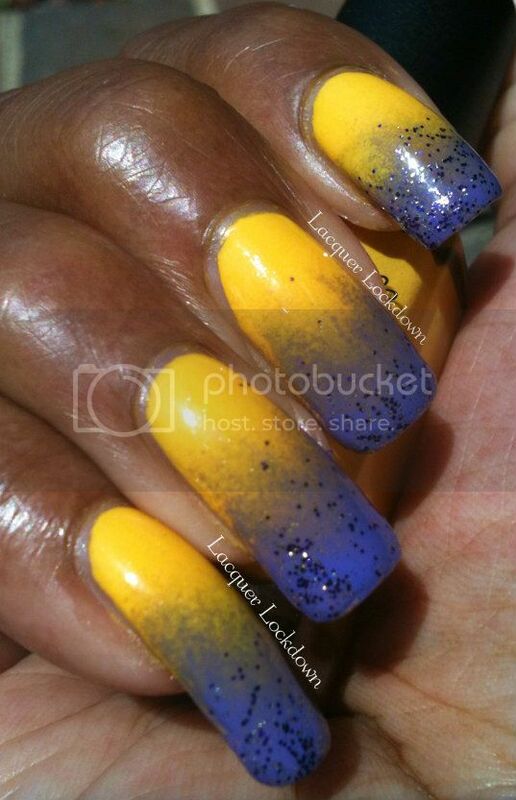 I started with Color Club's Almost Famous - a bright yellow creme. 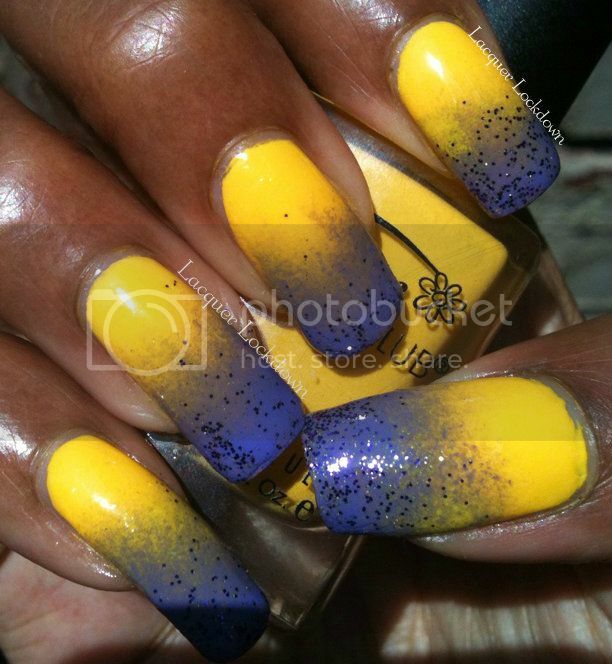 Let me say I'm seeking the holy grail yellow nail polish i.e. opaque in 2 coats with minimal streaking etc, If you know of such a polish for the love of God leave me a comment below because Almost Famous wasn't even almost close. It took four merciless coats before I reached appropriate coverage! Color me...annoyed. 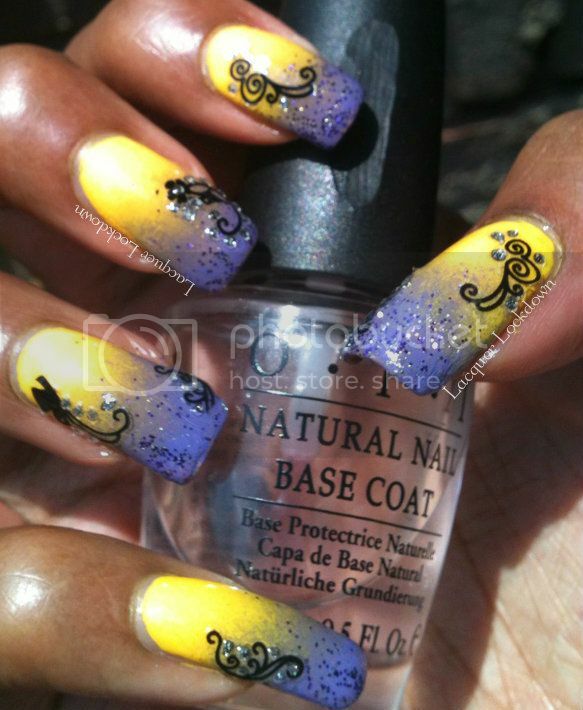 I also used Color Club's Puccilicious, a creme based purple which I love, to create a beautiful purplely blended gradient. I did hesitate a bit color choice wise as I didn't want to reach a gross weird gray brownish color in between the transition, but it came out beautifully. I loved this but I kept feeling like something was missing when I decided to add the Kiss Nail Art Stickers. I also gently sponged on Windestine's Pansies. This is a sort of dark purple and gold microglitter mixed in a clear base that's adding the sparkling magic to this gradient. I still got a bit of gray coming through the gradient in the middle, but I was able to keep it subtle. The last step was adding some Kiss Nail Art Stickers that came in a little pack I found at Bed, Bath, & Beyond. I am so happy with the final look here! Lovin' the bling per usual! If you are interested in Pansies unfortunately no longer being made by Windestine due to some issues with her supplies, but you can still check out some of her other beautiful glitters on Etsy. This seller is just so wonderful and a pleasure to work with and her formulations are amazing! Personally, I love the final effect here - simple but pretty. What do you think? Thanks for reading and please comment below! This is beautiful! 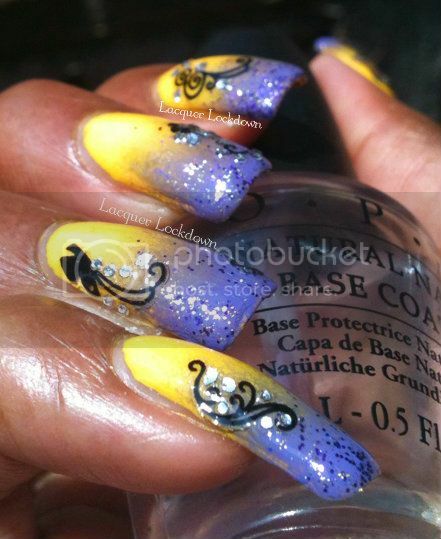 I really love the purple and yellow together! Thank you hun! I was so worried it'd turn to mush in the middle, but so mad that color club polish chipped later the same day!